Let’s Thank Our First Responders During Florida First Responder Appreciation Week. Governor Rick Scott has proclaimed the week of January 5-9 Florida First Responder Appreciation Week. Each day, thousands of Floridians risk their lives to protect our families and provide us with medical assistance any time we need it. As a mother and grandmother, I take comfort knowing there are many brave men and women in our state’s communities who have chosen to serve as law enforcement officers, firefighters and paramedics. I admire their bravery and selflessness and my heart goes out to the law enforcement community, which has recently suffered the loss of two officers killed in the line of duty. I am proud Governor Scott has designated this week to honor and thank Florida’s first responders, and I have asked all state superintendents to work with the schools, teachers and principals in their districts to remind our students about the sacrifices first responders make daily to keep us safe. I encourage Florida parents to also help their children show support for Florida’s first responders. This is a great opportunity to teach our state’s children a lesson that cannot be found in any textbook – the value of gratitude for those who serve and protect our communities. Art projects that can be given to first responders to serve as a constant reminder of appreciation. I know we have many talented students throughout the state and I look forward to seeing all of the wonderful ideas they come up with to thank our first responders. We are going to feature the students work on the department’s Facebook and Twitter pages, as well as our blog. If you would like to share your demonstrations of appreciation, please email Kassandra Elekes at Kassandra.elekes@fldoe.org. Commissioner Pam Stewart announced an investigation of standardized testing in Florida public schools and issued a call for Floridians to serve on the newly established Keep Florida Learning Committee. Commissioner Stewart will work closely with districts to gather complete and accurate information on the tests being administered to meet federal, state and local requirements. Department staff will compile the information and analyze the data. Findings will provide policy makers, district administrators, parents and teachers with information about the number of standardized tests and how each of the test results are used by the state, school boards and teachers. A primary purpose of the report is to increase transparency for parents about the use of standardized testing in Florida’s public schools. The Keep Florida Learning Committee will review further deregulation opportunities for the school system; review instructional material review processes used by school boards; identify strategies to increase parental involvement; and review the implementation of the Florida Standards and the Florida Standards Assessment over the next year. Beginning today, all Floridians interested in serving on the committee are encouraged to submit an online application to the DOE. To apply, visit http://www.fldoe.org/about-us/fsacommittee.stml. Interested Floridians have until January 31, 2015 to submit their application. The first meeting will be an organizational conference call and will take place in March. Committee members will be announced in February. The committee will be comprised of 11 members, including the Commissioner of Education, legislators, teachers, superintendents, school board members, higher education representatives, and members of the public. For a list of frequently asked questions regarding the Keep Florida Learning Committee visit http://www.fldoe.org/about-us/KFL-FAQ.stml. “How did Max help the grocer understand what he needed from the store?” I asked Mrs. Lamb’s Kindergarten class. Nearly every hand shot up. We had just finished reading the book “Bunny Cakes,” which tells the story of the misadventures Max and his older sister Ruby encounter while trying to bake cakes for their grandmother. 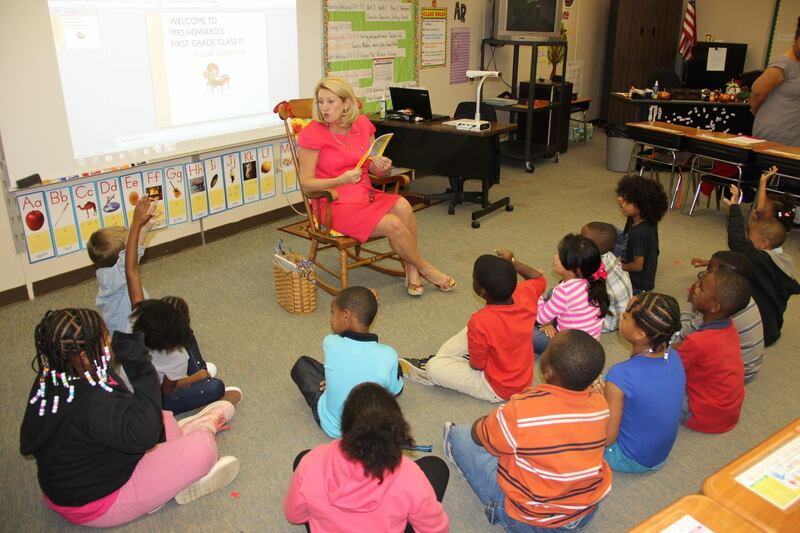 Reading the book “Bunny Cakes” to students in Mrs. Lamb’s Kindergarten class. The struggles that Max encounters in the book are similar to the ones our youngest students experience every day as they develop literacy skills. As a former educator and principal, I can tell you that reading and writing fluency are improved through practice and repetition. However, this season of early skill-building can often be challenging for students…and their parents. Asking questions about the two main characters in the book “Bunny Cakes. A student’s early writing projects are often filled with misspellings and missing punctuation marks. But don’t get frustrated; students learn best through practice, both inside and outside of the classroom. Parents can foster their children’s confidence, and ultimately their passion for reading, by focusing on the process and less on the final product. As winter break nears, there are many activities families can take part in to support and encourage lifelong readers. Here are a few ideas to promote literacy in your home. Create a Reading Hour – Set aside one hour each day during the winter break as a “reading hour.” Make sure each family member, including parents, has plenty of books to choose from and a comfortable and quiet place to curl up and read. Make Grocery Lists – Ask your child to write down the family’s grocery list before heading out to the store. Praise your child during the activity, even if they misspell certain words. For very young children, have them draw pictures of the items on the list. Find Age-Appropriate Books – Ask your librarian about age-appropriate books. Often children become discouraged when they attempt to read a book beyond their reading level. Both the public library and the school’s library have many options available. Play Rhyming Games – Entertain each other during long car rides by rhyming new and challenging words. Write a Book – Encourage your child to write a book about his or her winter break and read it to the whole family. Ask Thought-Provoking Questions – After picking out a book to read aloud, ask your children questions about the story that will develop their critical-thinking skills. For example, I didn’t ask Mrs. Lamb’s students to identify the color of the marshmallow squirters .Instead, I asked them to explain Max’s actions to solve a problem. For additional ideas, visit the department’s Pinterest page at www.pinterest.com/floridadoe/ and check out our “Winter Break Activities” board. Visiting with Mrs. Lamb and her students. At the end of the book “Bunny Cakes,” Grandma Bunny was proud of both Ruby’s perfect bunny angel cake with raspberry-fluff frosting and Max’s messy earthworm cake. What a great example for all of us to see the value of a child’s perseverance. 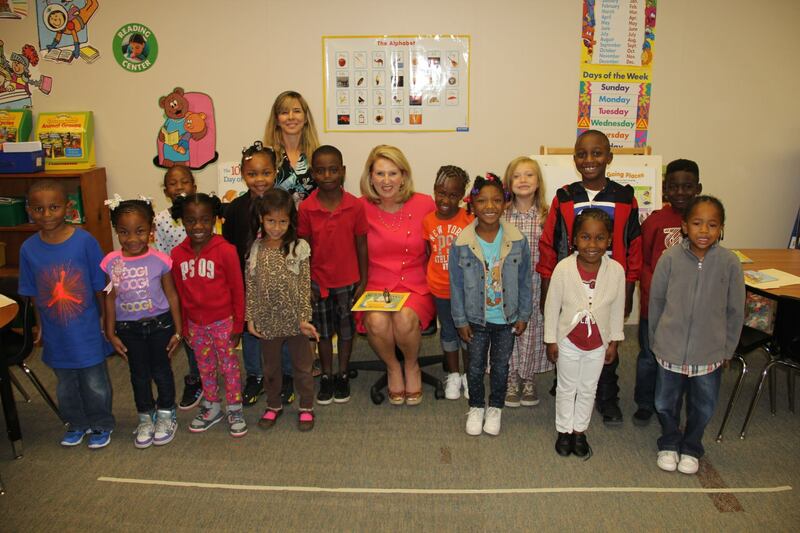 About the author: Commissioner Pam Stewart leads the Florida Department of Education, which supports Florida’s Pre-K-12 education system, serving more than 2.7 million students and 192,000 educators. She is a former teacher, principal and deputy superintendent.